TATS A KOOL CHALLENGE: Snowflake time again! This year I have given myself another challenge!!! 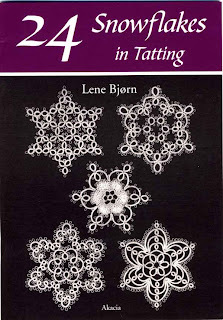 To tat every snowflake in Lene Bjorn's book 24 Snowflakes in tatting. I bought this book before last Christmas and just looked at it. 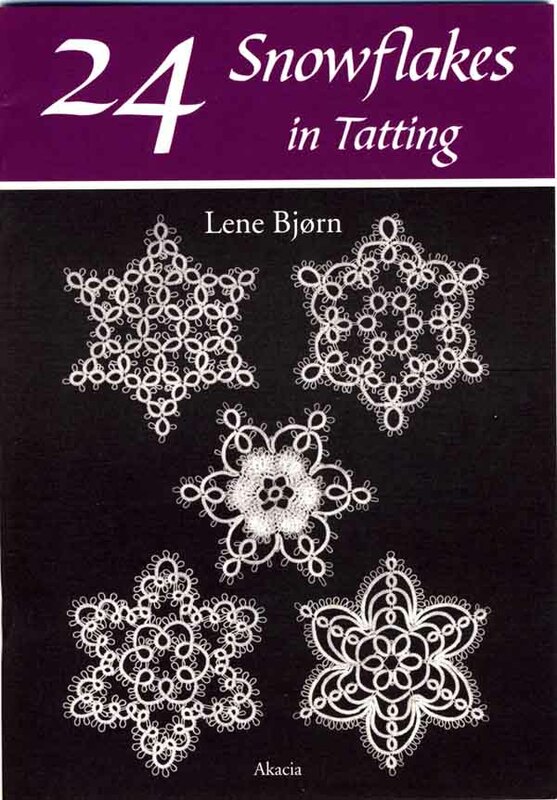 It's a great little book, for a very small outlay you get 24 great designs....not a lot of instruction so you need to be confident just tatting from diagrams. The other bit to my challenge is to tat them in order...not just pick out the ones that I like best...give them all a chance to shine! Now note this well... I didn't give myself a deadline!!!! so it may take several Christmasses!!! As it's December the 1st today ( and I am going into Christmas panic...impossible at this late stage to make all my cards and gifts and get them in the post in time)...it is a good idea to start showing my progress. I started with Altin Basak a 3 ply soft thread that is a ... to unpick. This is a very pretty delicate colourway. 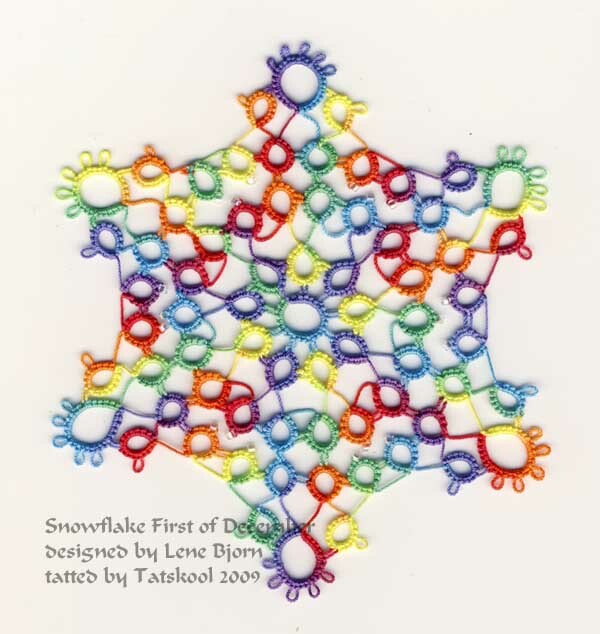 Several others have said that this is the one design that nobody wants to tat...and they are right...those little lengths of thread between the rings are a pain. But trying to get it right is great practice. So I made it again in White, 'cos I love snowflakes in white....almost as much as I now love them in colour!! It actually looks better in this scan than it does in real life as it is in size 20 and is too big. 4.5inches at it's widest point. The next one , yup there is another one...is in Floretta 20 in a rich pink varig', slightly smaller than the Coats 20. Now isn't this getting more exciting as I get a feel for this pattern???? Not sure that the varigation shows up the design best. But i can't resist one final tat in my favourite thread of all time...you guessed it Rainbow Bright. Coats 30, add some beads and let's see what that looks like. Now this in yer face conglomeration of colours really works for me in this design. What do you think...all comments welcome...I need your input to this blog. Floretta 20 Sh1 11m, Sh 2 60cm. Don't forget that you may need more, especially if you make longer picots. One last look at them all to compare the sizes. See ya tomorrow...if I get it finished!!! 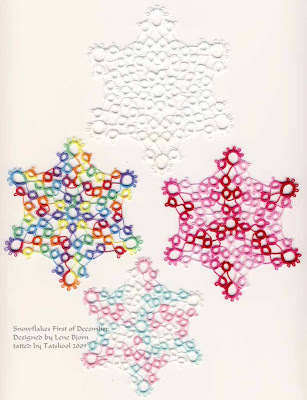 If you tat each snowflake in the book three times, you'll have a mountain of them - how lovely! 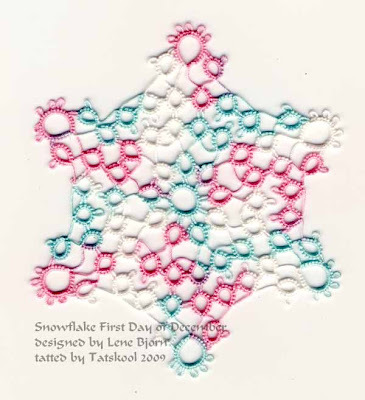 I seem to remember that the flake for December 20 is also a difficult one, I had battles with that a couple of years ago. Good Morning Pamela!! 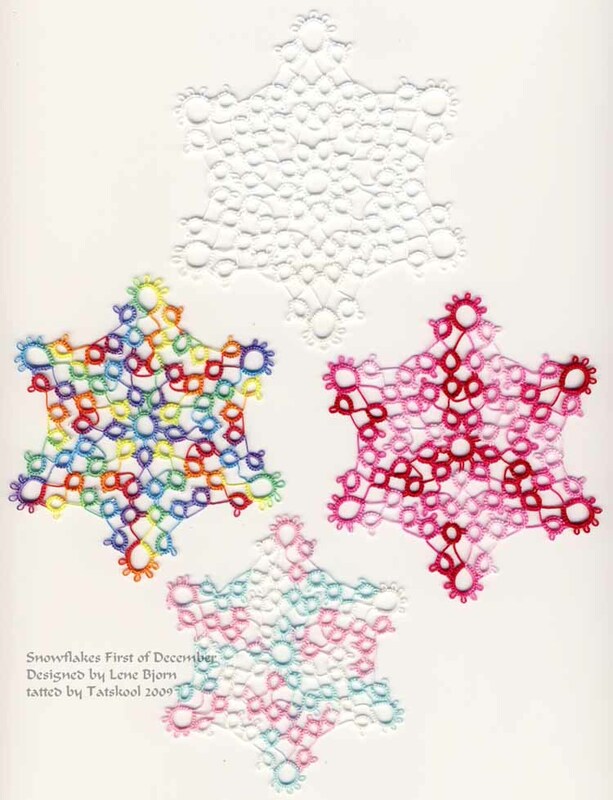 Oh how fun that you will be tatting all the snowflakes in this book. 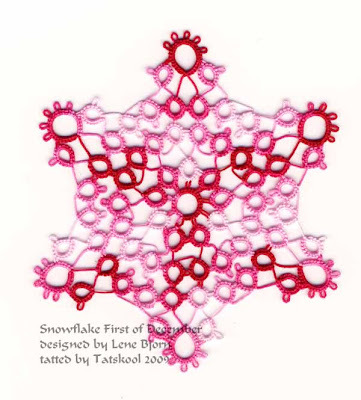 I really enjoyed watching your blog last year for updates when you tatted Jon's snowflakes. It's so nice to see snowflakes in such awesome colors like your Rainbow Bright and I also like the variegated pink Floretta. Nicely done. Looking forward to seeing all the snowflakes in this book. I don't have this book yet. I'm busy tatting, but I can't blog it yet, it's for my SS exchange. I think it's a great challenge! Maybe I can get inspired to do this one with you. As you know, I already have December the First done, too. The red variegated flake is my fave as far as color and the flake done with the Altin Basak thread is my favorite because for the size. You are such a fast tatter! Keep 'em coming. I am always astounded at your teemingness of tatting! Your work is so amazing and there is always so many things to look at! Those are so pretty - especially the Rainbow Bright one! You will be happy with the results when you get them all tatted. They are BEAUTIFUL! I can attest to that as I have done them all. They look great on my tree, too. A flurry of snowflakes and it is impressive to see how tenacious you are in getting the bare lengths of thread just right. Rainbow Bright does not overpower the design of this flake, in my opinion. I really like the bright colors here. Great job on your latest challenge! They're lovely! I like your Rainbow Bright one the best. It's so very cheerful. You did very well with that bare thread -- that's the one that scares me off too. I guess I will have to dig out my book and give it a go. Maybe using beads on every bare thread would be a good way to get them the same size! 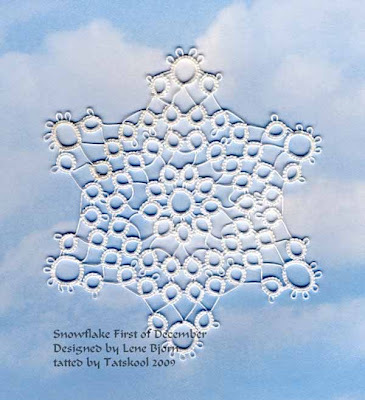 I LOVE YOUR SNOWFLAKES. Have a great day! Gosh that is a challenge to tat all of them! Just would not have the time or patience. Good Luck! Hi Diane, your really should suffer as much as I do! Shall I book you in for those lessons!! oh if only! Hi Carol,not sure if this is fun or not, bit pressurising at this time of year, I am mad! Great experience tho. Hi Steph, you should def join in you might encourage me to keep going. I am flagging already! Hi Fox, glad you like the Rainbow Bright one, I keep coming back to it, it's hypnotic! Hi Maureen, i have a mountain already! Wont get to do them all let alone 3 times each. Hi Tatting marie, thatks for coming over and leaving a comment, without them I might just stop! blogging not tatting! Hi Marty beads on the bear threads would be lovely, but heavy and a huge amount to put on the shuttle, would need to use a Tatsy! Hi Rayanna, you too. Do keep leaving comments. Hi Sally, you have a lot of patience too you are just not as foolish!! Rainbow Bright is definately one of my all time favorite HDT too. I'm not sure how I'd do with that bit of thread left between the rings. It looks like you have that down pat. Cursed bit of thread, but you get it with practice and this was loads of practice.